The study conducted at Duke University tested the bioengineered muscle by literally watching it through a window on the back of living mouse. The novel technique allowed for real-time monitoring of the muscle's integration and maturation inside a living, walking animal. The results appear the week of March 25 in the Proceedings of the National Academy of Sciences Early Edition. "The muscle we have made represents an important advance for the field," Bursac said. "It's the first time engineered muscle has been created that contracts as strongly as native neonatal skeletal muscle." 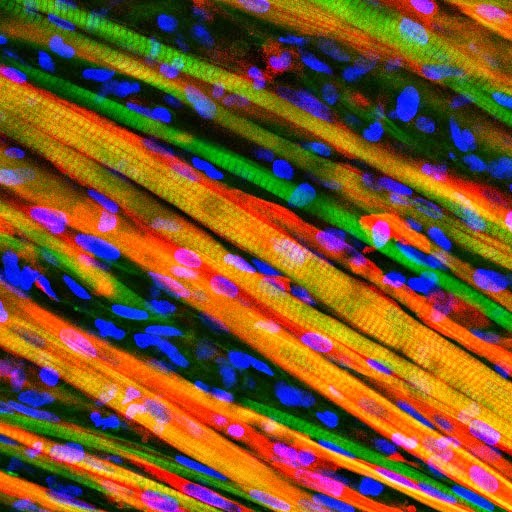 Through years of perfecting their techniques, a team led by Bursac and graduate student Mark Juhas discovered that preparing better muscle requires two things well-developed contractile muscle fibers and a pool of muscle stem cells, known as satellite cells. Every muscle has satellite cells on reserve, ready to activate upon injury and begin the regeneration process. The key to the team's success was successfully creating the microenvironments called niches where these stem cells await their call to duty. "Simply implanting satellite cells or less-developed muscle doesn't work as well," said Juhas. "The well-developed muscle we made provides niches for satellite cells to live in, and, when needed, to restore the robust musculature and its function." By genetically modifying the muscle fibers to produce fluorescent flashes during calcium spikes which cause muscle to contract the researchers could watch the flashes become brighter as the muscle grew stronger. "We could see and measure in real time how blood vessels grew into the implanted muscle fibers, maturing toward equaling the strength of its native counterpart," said Juhas. "Can it vascularize, innervate and repair the damaged muscle's function?" asked Bursac. "That is what we will be working on for the next several years."